Just a reminder, if you want to explain away any of the mistakes then it has to be with in-universe canon explanations only. So Novels, Video games, tech Manuals and your 3rd Cousin Bob twice removed are NOT valid sources to explain away the mistakes. With all that out of the way, let’s begin! This episode was really well done when it comes to mistakes. As you’ll be able to see there are very few of them. But this episode does raise a question for me in regards to the bio-filters. In this episode, Picard suggests that the Transporters Bio-filters could have screened out the Supposed disease the Ornarans have. That’s all well and good, and Jives with some of the other episodes all throughout the TNG Era series. Watch LaForges Phaser in the Riker Sludge Scene. 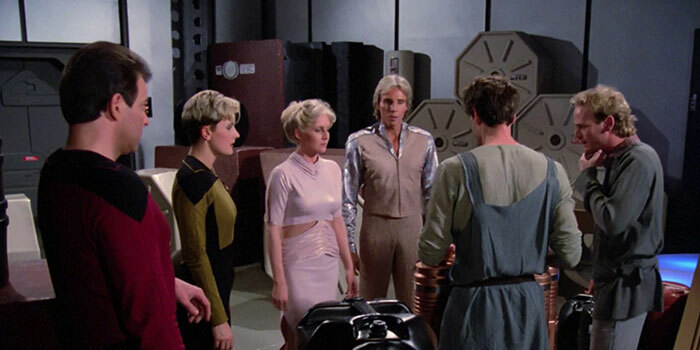 Right after Riker is taken by Armus, the team runs up to the edge of the oil slick. When they do, LaForges phaser pop out of its holster. Does this seem like a good holster design? Watch Picard’s towel when he heads to the bridge, after sitting down in the Captain’s chair it continually changes its position. Maybe it’s part of Manheim’s Experiment? Another one of those position changing mistakes. 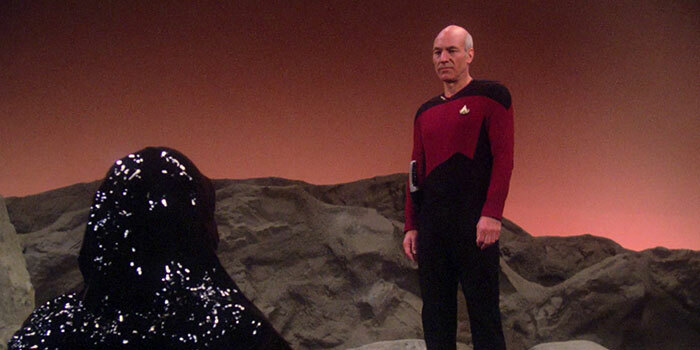 Watch Picard as he enters the holodeck. First, the Eiffel Tower is directly in front of him just beyond the table where the 2 lovelies are sitting. Then he walks with the waiter to his table and decides to head to the left and check out the view. Once again the Eiffel Tower is in front of him, how can this be? Ok so Picard’s old love flame wants answers, and so she discusses the facts of what had happened between them 22 years prior and asks Picard why he didn’t show up at the cafe. She also mentions she waited all day for him and that it was raining. 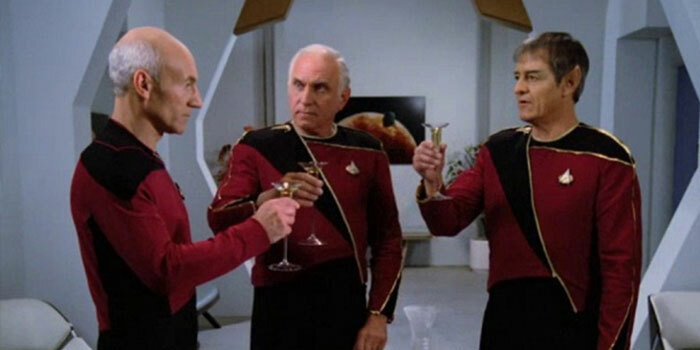 Later on Picard recreates the cafe just as it was 22 years ago and we can clearly see it’s an open air cafe. So does this mean she sat in rain all day waiting for Picard? At the end of the episode during the antimatter data scene Data exclaims, it’s ME! Does this seem right? First, off we’re told Data can not use contractions in many episodes, second, it’s Bad grammar. The correct phrase would be “It is I,” And that response would fit better with the speech patterns we’ve seen from data before and After this episode. At the beginning of this episode Riker orders LaForge to increase speed to Warp 6, LaForges response is a bit odd though. Full Impulse… Huh? Odd? 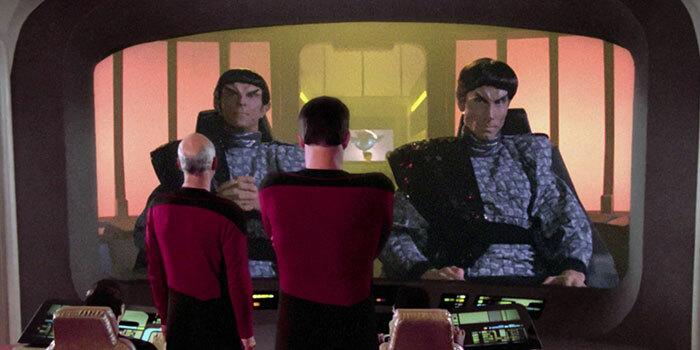 When Data is reviewing all Starfleet command decisions we get a great view of Starfleet data running across his screen. Then suddenly we see a parrot. 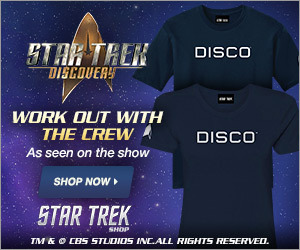 What exactly does a Parrot have to do with Starfleet Command Decisions? When Riker is being pummeled by Super Quinn, he calls for security. Next thing we know Worf and LaForge are running to the Admirals Quarters. How does this make any sense? Sure Worf makes sense, but LaForge? What happened to all the yellow-shirted security officers on the ship? Ok, so why exactly is Enterprise hanging out in Space while Picard shuttles to the Starbase? I mean we know from when Picard returns that speed is of the essence. So why didn’t the Enterprise herself merely go to the Starbase in the first place? Or once Picard found out the nature of the emergency why didn’t he have the Enterprise Warp to the Starbase to get him? So here’s one of those, “we did it for the plot,” moments… When Riker is explaining 24th Century things to the Cryo People, Picard Pages him. Riker then strolls over and uses a button above the replicator to respond to Picard. Huh? When has anyone EVER used a button to respond to a page? Don’t they always simply tap their comm badge to reply? Of course, if he hadn’t of done that, Offenhouse wouldn’t know how to use the comm panel later on the episode to annoy Picard. Speaking of the Comm Panel/ Annoy Picard Scene, later on when Picard goes to see Offenhouse to spank him for using them, he lies to Offenhouse. Picard says they are for official ships business only. Since when has THAT been true? We see ALL through out the series that communication is for anyone to use for any reason aboard the ship. 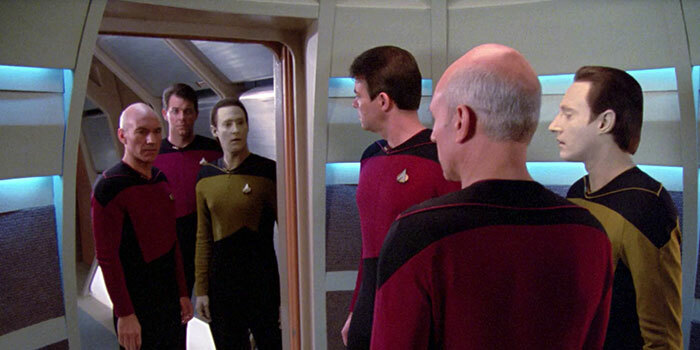 When Offenhouse strolls on the bridge, Riker ORDERS him removed by security. Security officers grab him but then leave him on the bridge during the entire exchange with the Romulans. Is this appropriate Starfleet officer behaviour? Well, that’s it for Season 1, thank you for watching today’s episode. See something I’ve missed? or do you have a canon explanation for one of the mistakes I’ve presented? Then leave a comment on the YouTube video below. For the next Mistakes Video we’ll be heading back to Star Trek: The Original Series and looking at Season 2 but id like your advice about this one. Going forward would you rather me make these videos by season switching between TOS and TNG. Or would you like a back and forth between the 2? 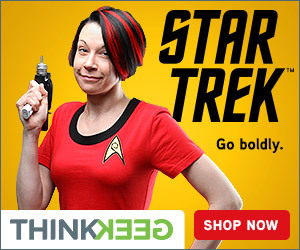 And what about the Other Star Trek Series? Would you like me to start to layer them in as well? Which other series mistakes would you like me to start doing? Click Here to leave a comment.